About a week ago, Ferrari hand picked a number of journalists to venture to Italy and have a day with the latest car to come out of Maranello, the F12berlinetta. This is Ferrari's new V12 powered, aluminum bodied top dog. Ferrari promises that this is the fastest road car ever to be adorned with the Prancing Horse badge. But what did we think? That's a toughie. In the 65-year history of Ferrari, V12 gran turismos are some of the most evocative cars that ever rolled out of Maranello. Gorgeous to behold, big and insanely powerful, these front-engined behemoths simultaneously conjured images of luxurious peregrination and the winning podium for tough endurance races. The F12 might be Ferrari's fastest car ever, but more important, it's the most fun Ferrari in years. Slap on a grin and hop on in; this is a rolling festival of perfection; a glistening red celebration of beauty, performance, and involvement that shames the all-new Porsche 991-chassis 911, the Lamborghini Aventador, and everything between. Imagine supercar performance, luxury-car accoutrements, and driver's-car steering. It is, if you can indulge us in a made-up word that's as silly as the car's official name, F12brilliant. It says something profound that 731 hp feels about right in the F12 berlinetta. Throttle response is instantly gratifying all the way from idle to the wailing 8,700-rpm cutout. But the V12 begins to sound musical only from 3,000 rpm, and there's a marked increase in tempo and intensity at 6,000 rpm. Although it's one of the world's most awesome engines, it doesn't dominate the F12 as you might expect. It's just one superb part of an incredibly harmonious whole. The F12 will get from 0-62mph in around 3.1 seconds – and on to a top speed of around 210mph. If you want to make the most of this car's performance, you'll need a race track – preferably a very large one. There's no pause between gears, it just keeps going inexorably until you run out of road or, more likely, courage. While the F12 has seriously quick steering — 2.0 turns lock-to-lock — there's no hint of nervousness, just euphoria. Cornering loads result in a steady increase in effort and every degree of motion results in a predictable reaction from the car. Trust builds quickly when driving the F12, and the chassis does everything better than you expect it to and without any fuss. There is more roll compliance than we expected, but it doesn't negatively impact grip from the meaty Michelin Pilot Super Sports or handling stability. The interior is modelled closely on the 458 Italia, but with certain elements that are unique to the F12. Most of the controls, including the indicators, lights, wipers, engine start and Manettino dial are located on the steering wheel. The latter allows you to toggle through five different driving modes and tweak the gearbox, E-diff, ABS, suspension and stability control. There's no central display, instead the sat-nav and audio are shown on two tft screens flanking the huge central rev counter, while the bulls-eye air vents are a completely new design. Of course you want it. The F12 berlinetta practically defines "desirable." It updates Ferrari's most traditional road-car formula in so many ways and makes its predecessor appear a little slow and unsophisticated. 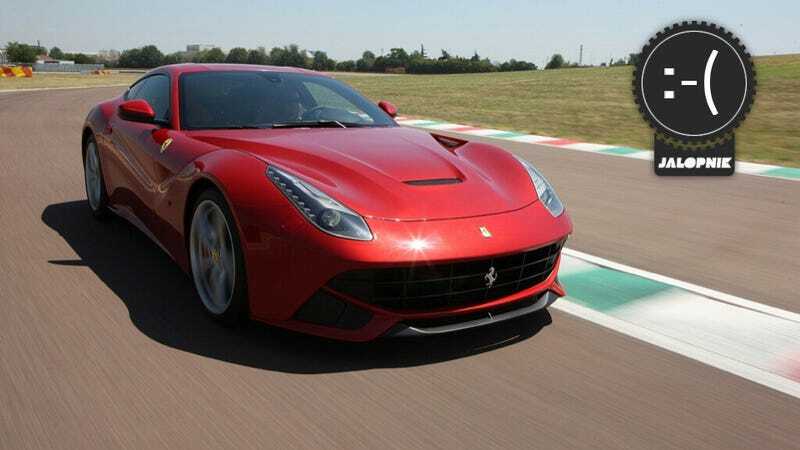 The F12 berlinetta is due to launch in the United States next spring, five months or so after European deliveries begin. Based on the higher-than-599 price already announced for Europe, it is likely to cost $300,000. Ferrari's civilian buyers, once considered merely a source of funds for racing efforts, are now important enough to drive vehicle design and development. The company is even throwing in seven years of free maintenance. Suddenly, the road-car customer is king at Ferrari, and it's good to be the king.